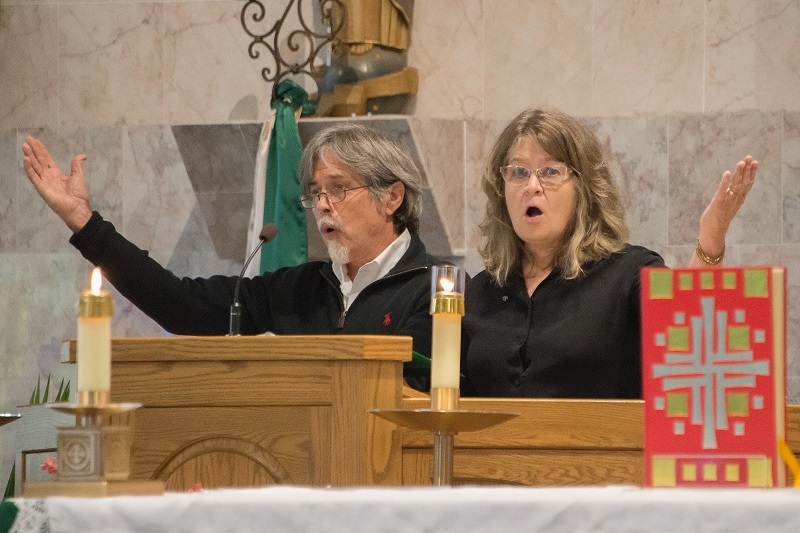 Michael McCarthy and Ande Gaines McCarthy cantoring at their church. Courtesy of Michael McCarthy. 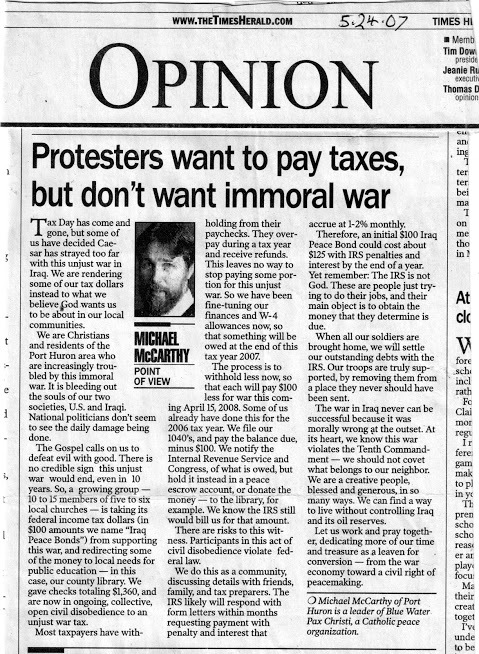 In May 2007, I wrote an article (pictured below) for the Port Huron, Michigan Times Herald called “Protesters want to pay taxes, but don’t want immoral war” about our project, “Iraq Peace Bonds.” We’d formed a local community to openly redirect some of the federal income tax money going to the Iraq war, in doable amounts — increments of $100 to meet human needs. Easier said than done, but worth the effort. IRS collection does not invalidate one’s efforts, but does often “double bill” us — yet new dollars have already gone for peace. In our first 15 years of marriage we in this way preemptively redirected a cumulative over $13,000 refused, paid for peace, and not collected on, all those years. Eventually we bought a house in town, after 2 simple country homes built in Kentucky and Michigan with funds direct from our paychecks and the sweat labor of ourselves and community church friends. Needing a mortgage now we had to establish credit for the first time, and settle with IRS. It was our initiative because of needed family changes, not IRS demands. That’s not the case for every tax resister though, and IRS computer cleverness does seem to be improving. 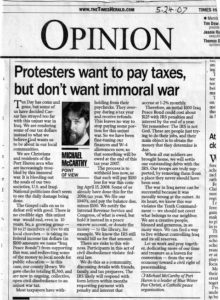 To make peace-not-war tax a more accessible movement for more working- and middle-class people, one must start at the beginning, preventing withholding. To not prepay the IRS should be an important initial focus. Keep as much as possible of job or retirement disbursement income out of IRS hands. Redirect it to your own or a collective peace fund. NWTRCC has the expertise, and we all can become better at this in our local areas. You have to owe the IRS on April 15th in order to refuse and redirect your money. Few refuse an IRS refund. When we started our efforts at peace tax in 1978, we were both embarking on medical professions (registered nurse and physician assistant) that had potential for lucrative incomes. Over the years we tried to limit our war tax liability, by both working as much part-time as possible (sharing care of our four children with the time gained), sometimes bargaining down salary in favor of benefits, and contributing forgone salary amounts to the cause of the community clinics we worked in. We are both retirement age now and have some significant savings as a result of putting (at times) 25-50% of our combined income into IRAs and 401(k)s.
Port Huron Times Herald article. (Click to view larger version.) Courtesy of Michael McCarthy. Now we’re in a situation, as are many of our friends, of beginning to get required minimum distributions (RMDs) from these retirement funds —which means confronting the war tax liability. To be able to be war tax re-directors, we have to tell the fund managers not to deduct federal tax from each RMD, so that no income tax is withheld. This income is reported on a Form 1099-R. In 2013 we gathered another group, and demonstrated against prepayment for war, and enabling peace tax redirection. We burned our 1099-Rs and W-2s and dropped the ashes into a crystal bowl of blue water (we’re the Blue Water city — Port Huron) with songs and protest signs. Out of the war ashes would come the phoenix of peace investment. There were six or seven of us on the boulevard between the courthouse and the public library, flanked a little further down at the river by the municipal police station. No authorities objected, but little notice was taken, except by some of the pedestrians who stopped to talk. Most recently we held a meeting of our local peace group, Blue Water Pax Christi. In these times of increasingly ominous inequality, racism, and military expenditure, we were sounding out our own members on their willingness to make WTR a focus of our activities. There was heartfelt honest discussion, but none of the 10 present could at this point commit to this as a collective direction for the group. They did affirm and support our intention to resist and redirect this year. And this is the central importance to all our efforts we believe — sharing openly with family, church, and community the desire to pay responsibly for cooperation with the good, and a noncooperation with evil. There is more discussion and discernment going on than in the past. God bless us with inspiration, courage, and growing solidarity.